Prime Minister Shinzo Abe claims that Japan needs high-level talks with Russian leadership to resolve outstanding territorial disputes. TOKYO (Sputnik) – Japan needs high-level talks with Russian leadership to resolve outstanding territorial disputes, Prime Minister Shinzo Abe said at a press conference on Monday. "You cannot solve the Northern Territories problem without a summit," Abe said, using the Japanese term for the Kuril Islands bordering the Sea of Okhotsk and the Pacific Ocean. 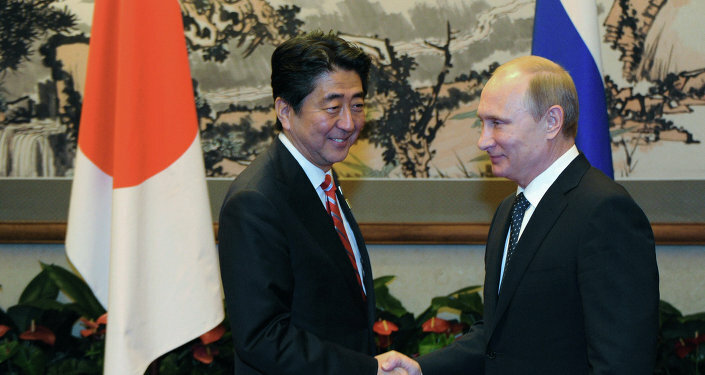 Abe issued the same calls for talks with Russia early last month. Russian President Vladimir Putin was due to visit Tokyo in the fall of 2014, but the trip was postponed against the backdrop of geopolitical tensions. Putin met Abe on the sidelines of the G20 summit in Turkey in November. Putin’s visit to Japan long touted for late 2015 has been postponed indefinitely. Kunashir (known in Japanese as Kunashiri) and Iturup (Etorofu), as well as Shikotan and the Habomai islands, have been the focus of a territorial dispute between Russia and Japan for more than 60 years. The dispute has prevented the two countries to sign a permanent peace treaty after the end of World War II.